Hey guys. As some of you may already know, I wrote some updated practice codes based on Dan Salvatos codes. Below you can find the instructions on how to install and use them. Let me know if something isn't working properly or if you want something added. All original practice code features are still included in the new version. NTSC-U codes have been tested with the ISO and disc, PAL and JP only with disc (should work fine with an ISO though). Press left on the D-Pad to save Marios position, press right to load the saved position. The new codes also save the direction Mario is facing, so you don't have to adjust it everytime. (Toggle) Press up on the D-Pad at any time to replace all dialogues with a single line containing "!!!" and set max scroll speed. Game Events (Chucksters, Piantissimo, Blue Coins from Piantas, ...) still work. Press D-Pad down to set dialogues back to normal. (Always on) Makes all FMVs skippable by default, without having to watch them once first. (Always on) Prevents the game from setting the blue coin flags after you collect them. Resetting/-loading the stage therefore also resets the blue coins. As a side effect, your blue coin count will be stuck at 0. To use the practice codes you need Homebrew on your Wii. After installing Homebrew, download this archive and unzip it somewhere on your computer. Since the new practice file exceeds the codelimit given by kenobiwii, a recent revision of Nintendont is necessary. To make it easier, I included Nintendont 4.434 in the archive, which I've been using to test the codes. Place the codes and apps folder of the zip archive into the root of your SD card. Make sure there is no other GCT file in games/GMSX01/. The Level Select code is a extension of Dan Salvatos original NTSC-U practice code and ParadoxKarls NTSC-J port. The Save States are an extension of Dan Salvatos original NTSC-U Save States. Thanks to Wilko for suggestions and testing! This is sick! I suggest to make warps for King Boo, Casino, Eel, Sandbird, and Ricco 2 secret. Would also be cool if you could to switch to any nozzle at all times. Yo this is amazing! To add onto Diddeh's suggestions, it would be really nice if there was a way for Sirena Shines that take place in the hotel to just put you straight in the hotel, kind of like how reloading a Pinna Park shine works. The Dialogue skips luckily already make Sirena a lot nicer to practice! Do I have to have the original codes on my SD card for this to work, or do these work independently? Mousecopp these work independently. Also one funny thing weird about the codes but not a really big deal, if you mash A to skip the cutscenes in Pinna 1 it resets the game, though that might not be fixable just because those cutscenes are weird. Originally posted by GohgoDude(...) but do you think you could make it possible to select which level you want to go to right off the bat on the Z-menu? That's something I've been playing with, more specifically I want the Z menu to open the builtin debug HUD where you can select all stages. Might be included in a future release. Originally posted by GohgoDudeThis is a bit off topic, but could you tell me how you made these codes? I'm interested in learning so I can try all sorts of things. If you're just starting out, on Youtube you can find Dans detailed video guide, where you can learn all the basics on creating Gecko Codes! Here's some ressources for more complex stuff like button events and asm injection PPC documentation for the assembly and Gecko Code Type Documentation. I would suggest you to watch his guide and then look at the source of the practice codes I linked above. Translate the code back to assembly and try to understand what is going on. Here I wrote a detailed explanation of the Level Select code for you. Originally posted by MousecoppDo I have to have the original codes on my SD card for this to work, or do these work independently? The codes work independently, you shouldn't have two cheat files with the same name on your SD card anyway, Nintendont doens't like that. Originally posted by StrongmanLinAlso one funny thing weird about the codes but not a really big deal, if you mash A to skip the cutscenes in Pinna 1 it resets the game, though that might not be fixable just because those cutscenes are weird. Also, talking about Pinna Park, I got a few messages regarding Pinna Park still being broken on JP when trying to switch stages. Fix for that is in the works as well. It wasn't possible to fix it yet since I initially made the new Level select as compact as possible to work kenobiwii. (It's actually the same length as the old Level Select code). Anyway, thanks for the positive feedback and further suggestions. I'll notify you when an update is ready. dapperpenguino, Zairite and Gohgo like this. You can download the updated codes here! - JP: Switching Episodes in Pinna no longer resets the game! - You can now switch your alt nozzle at any time by holding B and pressing a button on the D-Pad. The switch takes effect as soon as you switch to your alt nozzle by pressing X once or twice depending which nozzle you're on. To let the game reset to the hover nozzle when entering a new level you need to release the lock first, otherwise you're gonna spawn with the nozzle you selected last. Same applies to nozzle boxes. Please note that secret and special stages will by default load the nozzle you had equipped when you entered it, with the exception of Eel and Bowser. Might sound a little complicated but just play around with it and you'll understand quickly. - Mecha Bowser cutscenes still reset the game. Until it's fixed you can just use the secrets warp to to enter the Mecha fight. - Sirena 5 still puts you in the Sirena 4 Casino. As workaround you can now use the new stage warp to the Boo Casino. Further improvements are in the works, but don't expect any new releases within the next few weeks unless there's something that needs to be fixed asap. The nozzle switch code is a modification of an AR code by James0x57. 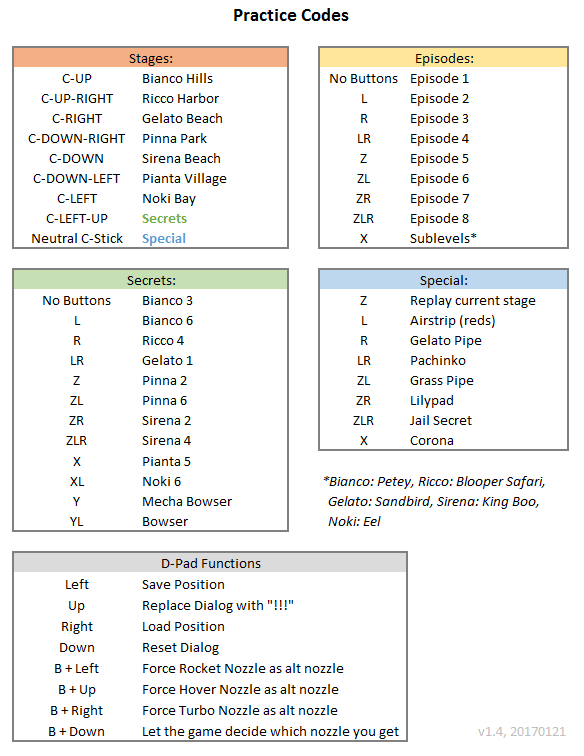 Thanks to bounceyboy for providing more information regarding the Pinna resets. That was ridiculously fast and ridiculously awesome. As if the previous update wasn't enough of a game-changer, this is near perfect. I didn't plan to update it that quickly but wanted to get the Pinna fix out asap. Yeah Fech told me about the JP memcard issue. However, that is actually Nintendonts fault (since it doesn't work even if you don't have codes enabled). Looking into it. Other codes have "d-pad down to die" and i was actually going to suggest it as well. could possibly make the dialog box a toggle with d-pad up to free d-pad down for the new code. Zairite and Gohgo like this. @Chaikitty: Make sure you unlock the nozzle (B & D-Pad Down) before entering/resetting the level if you used the nozzle switch. Even though the model is the same, you don't actually use the normal hover nozzle in underwater levels. As someone who's just starting to learn sunshine, these are a godsend, thank you! While I'm here, Pinna's still giving me some trouble; entering the mecha-bowser fight is consistently resetting the game, I think Wilko might be right.